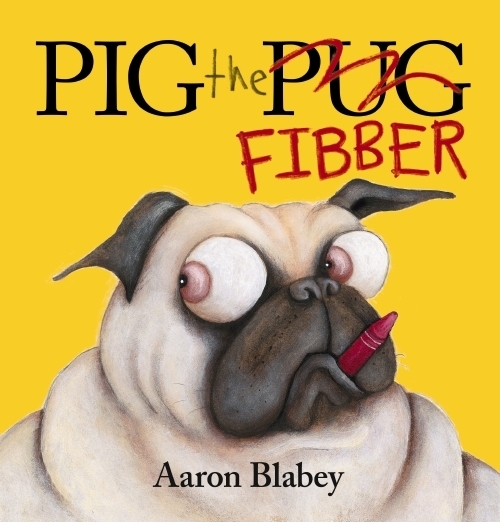 Pig the Fibber is the second book in the bestselling Pig the Pug series. The Pig the Pug books are about a naughty, cheeky dog called Pig who is always getting up to mischief. Pig the Pug was created by Australian children's author and illustrator Aaron Blabey and was published by Scholastic. The first book was called Pig the Pug and was released in 2014. It was followed by Pig the Fibber in 2015, Pig the Winner in 2016, Pig the Elf in 2016, Pig the Star in 2017 and Pig the Grub is scheduled to be released in September 2018. Pig the Pug has been a huge success. There are over 2 million Pig books in print and the series has been translated into multiple languages. The books have graced bestseller lists in over 30 countries from Australia to the USA to parts of Europe, Asia and South America. The Pig the Pug books have been nominated and shortlisted for a number of awards. In 2015 Pig the Pug won the KOALA Awards Picture Book of the Year and the YABBA Awards Picture Book of the Year. Pig the Fibber was shortlisted in 2016 for KOALA Awards Picture Book of the Year, YABBA Awards Picture Book of the Year and the CROC Awards Picture Book of the Year. In addition to writing Pig, Aaron is also the author of several other books including the bestselling Bad Guys series. Some of his career highlights include being awarded the NSW Premier's Literary Award for Children, two Australian Book Design Awards and a Children's Peace Literature Award. Pig the Fibber was my first Pig book. This book had me laughing out loud. I've never read a book that had such humorous illustrations. In the book Pig has gotten into the habit of telling lies to get his own way. He will do something naughty and will then blame it on a smaller dog called Trevor. Pig's expressions of glee when he got up to mischief and his looks of guilty panic when he got caught were illustrated very well. The book had a good message for kids as well and that was if you lie you can end up in a lot of trouble! It's better to just tell the truth.